At Pathways For Healing, as in many systems of subtle energy work, the chakra energy centers have been important in our understanding of the human energy field in health and wellbeing. We have a somewhat different perspective on the chakras and their qualities, which you can read about at this link. As in many spiritual systems we teach that the chakra energies and the states of consciousness associated with them act as portals to the spiritual dimension of experience. For example, many meditation systems work with opening ones heart chakra by practices such as breathing in energy or light through the middle of the chest and breathing out the quality of love. Or practices for opening the Third Eye, the chakra between the eyebrows, by bringing all ones attention there until the energy gathers enough to cause the this chakra to bloom with light from it’s seat in the brain forward through the forehead. Early in our studies of meditation and energy work we labored diligently to open different chakras through their front aspect, as we were led to understand would bring about spiritual development. Curiously, as we have continued our explorations, we found the spiritual opening we had been seeking to be more accessible through the back aspect of the chakras rather than the front. The back of the chakras, you say? If you’ve learned about the chakra energy centers through yoga, Reiki, popular books, or meditation, you may not have been taught that the chakras even have a front and a back aspect. Or, you may have seen illustrations of the bi-directional nature of the chakras, but little was made of it, especially spiritually. To date we have found no other systems of spiritual development other than ours that include or work systematically with the back aspect of the chakras. So, what’s all the fuss about? 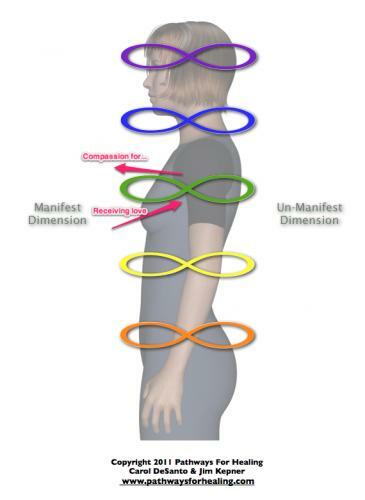 If we look at common side view illustrations for the chakras you might see something like Figure # 1. In these views it appears that chakras 2 through 6 have both a back and a front aspect. And while chakras 1 and 7 are often referred to as singular in nature rather than bi-directional, our understanding is that these are actually the front (1st) and back (7th) for each other. What is important about the back of the chakras? 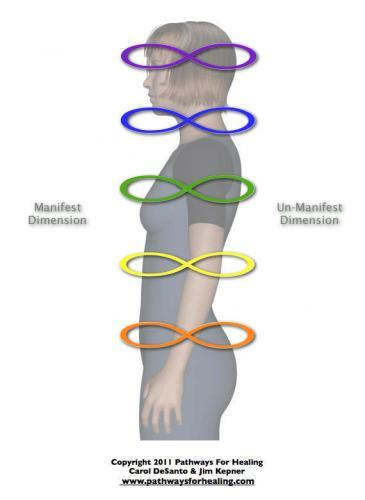 The front of the chakras the Manifest dimension and the back of the chakras is the Un-Manifest dimension. Doesn’t that just clear everything up? Okay, let me explain. And it certainly is true that; here we are in life, in the Manifest world, engaged in the process of coming to be... something. Aristotle referred to becoming as a change from potentiality to actuality. For us, the Un-Manifest would be the realm of potential and Manifest would be the realm of the actual, though perhaps the father of empiricism would not be fond of our mystical use of his principle! So, for example, when spiritual traditions speak of “opening ones heart,” they usually mean opening the front aspect of the heart chakra so we may develop love and compassion for others and for the Earth, open ourselves to receive love as well. In other words, these practices are intended to make us more open in our heart-relations with the Manifest world. We represent this giving and receiving flow of energy in the relation between a chakra and our Manifest world as one half of a figure eight, such that we could draw our own chakra chart as you see in the adjacent figures. 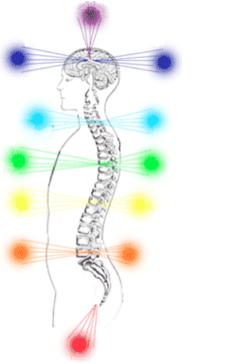 The back aspect of the chakras is our connection to the Un-Manifest dimension or world. The Un-Manifest is the dimension from which the Manifest world, well… manifests! 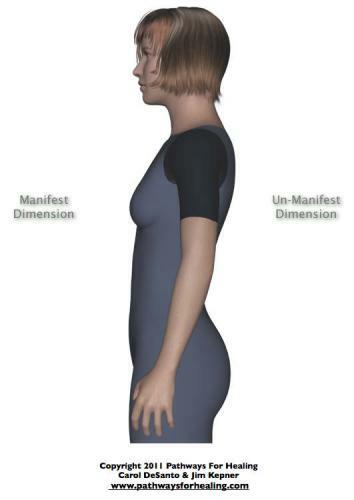 The Un-Manifest World is often spoken of as the invisible, hidden dimension that lies behind manifest world. Note the term “behind,” as it turns out this is not so much a metaphor as you might think, but is based on the way our chakra system works in these back and front aspects. The Un-Manifest is that-from-which-manifests, but is not itself manifest. And, importantly, the Un-Manifest is the realm of potentiality. Remember Aristotle? Potential is everything that has not-yet-become, is not yet Actual. And, as often is true in the spiritual realm, it’s even more than we think. In fact, potentiality is paradoxical. The paradoxical nature of potential is that it includes both what has not yet manifested, and what has already manifested. Our past is not gone; it’s part of our potentiality, because it effects what we bring forward into actuality in so many ways. In this sense, the back of the chakras connects us to our past, our lineage, our ancestors, the collective history of humankind, and so on. In our spiritual approach we have learned that opening the chakras in the direction of the Un-Manifest dimension by going back first rather than forward, is often an easier step than opening the front. Why? Perhaps it is because we are more closed and guarded, as we face our Manifest life. After all, it is the wounds and hurts of life that we have formed our defenses against, yes? Thus to open to the front is a challenge to everything we have formed to protect ourselves. Perhaps another reason is that going back first balances our cultural habit of being so very forward in orientation. Phrases abound in common parlance: push forward, advance your career, put things behind you and move forward in life, put on a good front, etc. This leaves us out of harmony with what is behind us, and disconnected from the well of Potentiality in the Un-Manifest. A meditation practice that acquaints us with the profundity and richness of opening the back of the chakras is called Resting Back Into the Heart of the Divine. The link will take you to a guided audio of this meditation that you can try. Like many of our practices, it is based on the principle of the Figure Eight described elsewhere on our website. People tell us that this meditation helps them find a palpable sense of the Divine and a deep sense of resting into a heart much greater than their own. You can find other guided audio meditations based on the Figure Eight on our Audio page.